Please hear me. You don’t need to throw out whole group instruction altogether to meet the needs of your students. You don’t need to cut your whole group time down to 10 minutes per day either. You DO need to differentiate your whole group instruction though so that it is productive and meaningful for all students. And GUESS WHAT?! It IS possible to differentiate this whole group time with 30 sets of little eyes on you! It’s all about the tasks that you choose to use and HOW you choose to use them. You don’t have to select 30 different tasks (or make 30 different modifications to a task) to differentiate your instruction. In fact, you can differentiate for the whole group with just ONE math task/problem. JUST ONE! Before we dive into differentiating your whole group instruction, you may want to read this post on Why “I do, We do, You do” Is NOT Always Best Practice if you are used to a classroom set up where students learn primarily from teacher demonstration. Some of my favorite ways to differentiate whole group instruction may not seem as impactful to you if we are not on the same page of the overall purpose or structure of whole group instruction. You may also want to check out this post as well— Transform Your Math Block With Math Talk. Math talk is a centerpiece for making whole group instruction meaningful and mathematically productive. If you are not giving students an opportunity to talk through their struggles and findings together then whole group instruction simply won’t be as effective as it is meant to be and you won’t see the growth that you hope to see in your students. I originally wrote this as one long post, but y’all… it was really long so I’m going to break all this up into a 5-part blog series. Alright, here we go. It’s not my style to knock anyone’s teaching practices. Instead, I’d rather show you what you might be missing out on by choosing to only use one teaching practice (such as small group instruction) and not even consider the benefits of another teaching practice (like whole group instruction). The truth is, there’s a time and place where BOTH strategies are useful, but we have to be sure we are balancing them appropriately to meet the needs of our students. All that to say, I worry that we have identified the problem that is lack of differentiation in whole group instruction (which is a very real issue in many classrooms!) and overcorrected it. Instead of thinking about how we could improve whole group instruction, we’ve decided that the only way to differentiate for our students is to make whole group instruction as short as possible so we can get to differentiation in small group time. As we’ve discussed above, you CAN meet the needs of your students within a whole group setting. Even better, we get all of the benefits that come from learning together as a whole group! If we completely throw away whole group instruction, then our students are missing out on the power of collaboration and learning from each other! One of my favorite things is to watch students debate about their work. Think about this… To debate about their work with a specific math concept, they have to understand their own thoughts and ideas well enough to communicate them. Then they have to listen to someone else’s thoughts and ideas to understand those. THEN they have to figure out how someone else’s work compares to their own work and then communicate the differences and similarities. And this doesn’t happen with just those two students! Other students in the class WANT to chime in with how their work fits into all of this and before you know, you have a whole class wrestling with big new math ideas. WHY WOULD WE WANT OUR STUDENTS TO MISS OUT ON THAT?! Through this discussion students are constantly building on each other’s thinking until we can as a whole group come to a conclusion about this concept. Don’t get me wrong, this takes a lot of facilitation from the teacher. It does not magically happen. It takes time teaching students how to engage in math talk. But it is worth it. Some of the best learning my students have had has come from whole group instruction! Just to clarify, this series is not to discourage small group instruction. In fact, thanks to a Tracy Zager for the recommendation, I’ve got Math Exchanges: Guiding Young Mathematicians in Small Group Meetings on my list of books to read in the coming months. Instead, this series is to open your eyes to the learning that can come from whole group instruction when it is done with differentiation and intentionality. Both whole group instruction and small group instruction are necessary parts of math teaching. If you want to learn more about the strategies I use to differentiate my whole group instruction, be sure to check out the remaining four posts that will be released in this series! I encourage you to try a few of these strategies, take the time to discuss students’ work afterwards, and see what happens. I’d love to hear your thoughts! Which of these strategies have you tried or are you excited to try? 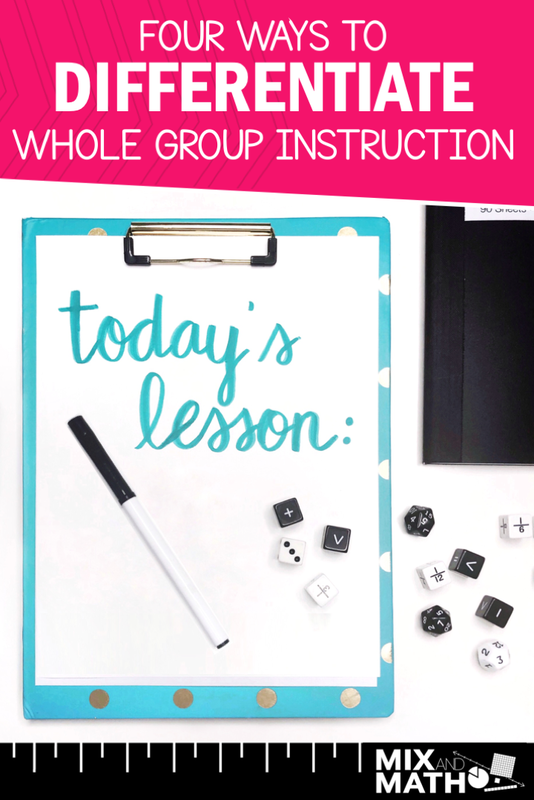 What are your thoughts on whole group instruction?